Chicagoans are the most-taxed residents of any major city in Illinois and pay the 10th-highest property taxes compared to taxpayers in other large U.S. cities. Mayor Rahm Emanuel and the Chicago City Council on Oct. 28, 2015, passed a record property-tax and fee increase that will hit city residents with more than $700 million a year in new taxes and fees when fully rolled out in 2018. The mayor said the city had no option but to raise property taxes. Other proponents justified the property-tax increase by comparing Chicago’s relatively lower property taxes to those in nearby suburbs. But both of these arguments ignore the multitude of other local taxes and fees – from bottled-water fees to cellphone taxes – that already make Chicagoans the most-taxed residents of any major city in Illinois. Even before the property-tax hike, Chicagoans paid three times more in local taxes and fees than Naperville residents, twice as much as those in Rockford, and nearly 20 percent more than the residents of Evanston. 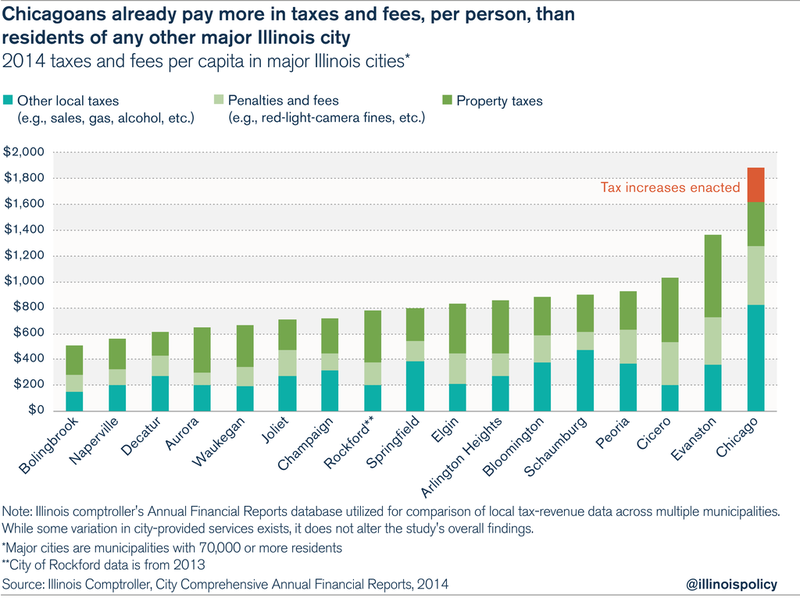 In all, the city subjects Chicagoans to over 30 individual taxes and a multitude of fees – far more than any other major Illinois municipality. Chicago politicians know people loathe property taxes – that’s why they opted for a smorgasbord of smaller taxes over the past two decades, hoping Chicagoans wouldn’t notice the overall burden they’re being forced to pay. When Chicago’s budget deficit reached $1 billion due to its pension crisis, it became clear that the failed status quo could no longer continue. Rather than make hard but necessary reforms, however, the mayor and the City Council pushed a record property-tax hike on Chicago taxpayers. Proponents of the tax hikes usually compare Chicago to suburbs with high property-tax rates. A recent Civic Federation report showed that Chicago had an effective property-tax rate of 1.8 percent in 2012, which is lower than the 2 to 3 percent effective property-tax rates in many of the surrounding suburbs. But that’s really not a fair comparison. Chicago’s property taxes are not low – suburban property taxes are high; in fact, the Chicago suburbs are home to some of the highest in the nation, as calculated by the nonpartisan Tax Foundation. Illinois has the second-highest property taxes in the U.S., thanks to Chicago’s suburbs and surrounding counties. In fact, Kendall County residents pay the nation’s 16th-highest property taxes when measured as a percentage of median home value. Lake County, Illinois, ranks 17th in the nation; McHenry County ranks 24th; Kane County ranks 32nd; and Will County ranks 33rd. That’s out of the more than 800 counties the Tax Foundation analyzed in its study. 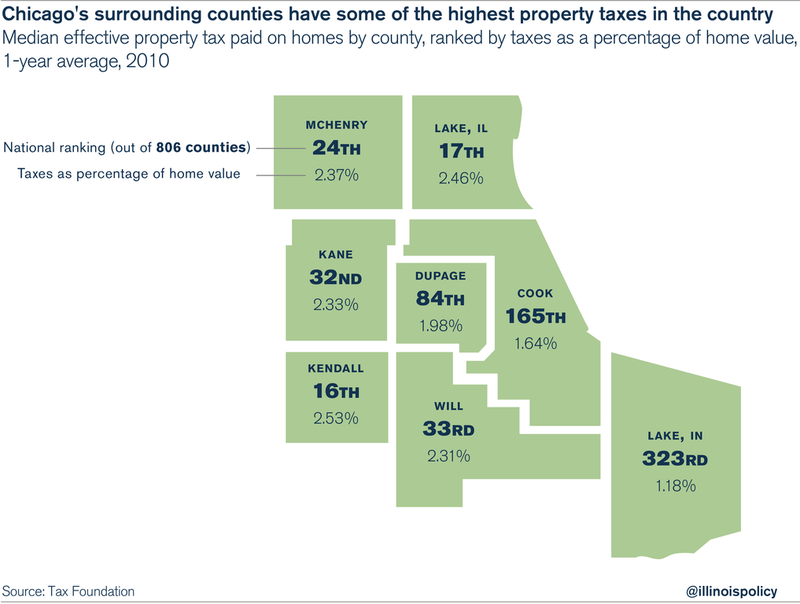 Compare those rankings to neighboring Lake County, Indiana, where effective property taxes ranked 323rd in the nation. Rather than looking at the high property taxes in the Chicago suburbs, a better measure is to compare Chicago’s property taxes to those of other major U.S. cities. A 50-state comparison conducted by the Minnesota Center for Fiscal Excellence and the Lincoln Institute of Land Policy shows that Chicago ranks 17th in the nation in effective residential property-tax rates and 10th for net residential property taxes when compared to the largest city in each state. Chicago’s effective residential property-tax rate was higher in 2014 than rates in Los Angeles, Atlanta, Indianapolis, New York City, Boston and Washington, D.C. In addition, Chicago’s effective commercial property-tax rates are some of the highest in the U.S. In 2014, the city had the nation’s third-highest commercial property taxes, behind only Detroit and New York City. Although it’s a myth that Chicago property taxes are low, especially when compared to other large cities across the country, it is true that Chicago relies less on property taxes to fund its operations than do other large Illinois cities. Beyond property taxes, Chicago politicians depend more on numerous other taxes and fees to fund the city’s operations. Other local taxes (such as taxes on sales, gas, alcohol, etc. ), which now account for more than $3 billion in revenue, or nearly half of Chicago’s budget, have grown at nearly three times the rate of inflation since 1994. Penalties and fees, totaling more than $1.2 billion in revenue, have grown at twice the rate of inflation since 1994. 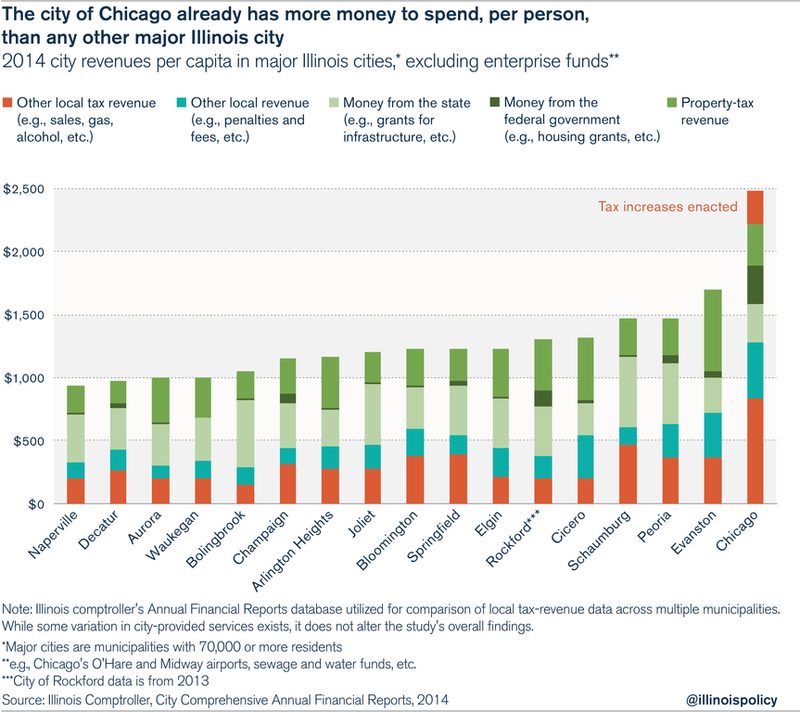 Both sources of revenue are larger than the property-tax intake for Chicago. 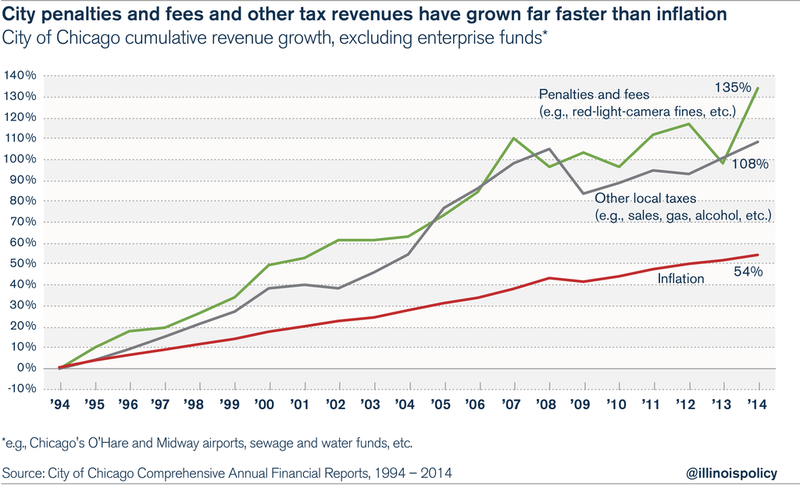 Those growth rates have propelled Chicago’s other taxes and fees (e.g., taxes on things such as gas, alcohol, etc.) to levels far beyond those collected in other Illinois cities. Chicago collected over $1,280 per person in other taxes and fees in 2014, almost double what Evanston, the second-highest taxing city, collected and more than four times what the lowest-taxing city of Bolingbrook took in. The high burden of other taxes and fees in Chicago is the reason why property taxes should not be viewed in isolation when comparing the city to surrounding suburbs. When all taxes and fees are combined, Chicago’s true tax burden becomes clear – and it’s not pretty. Proponents of Chicago’s tax hikes have also argued that the city has a revenue problem – that the city’s revenues are inadequate and have been for some time. But Chicago’s budget numbers do not back up that claim. In fact, the city has never had more money to spend. Increasing taxes and fees have caused Chicago’s revenues to grow nearly 50 percent faster than inflation over the past 20 years – at an annual average rate of 3.2 percent, compared with an annual average rate of inflation of 2.2 percent. Today, Chicago has $1 billion more than it would have had if its revenues had grown at the rate of inflation over the past 20 years. In fact, even before the 2015 property-tax hike, Chicago already had 31 percent more money to spend per person than Evanston, the city with the second-highest per-person revenues. And compared to Naperville, which collects the least amount on a per-person basis, Chicago has more than twice the money to spend per person. Soon enough, those who supported the 2015 property-tax hike will use the argument of “low taxes” to push for another tax increase. But their narrative – that city property taxes are low and that a property-tax increase is necessary – is false, and Chicagoans should reject it. 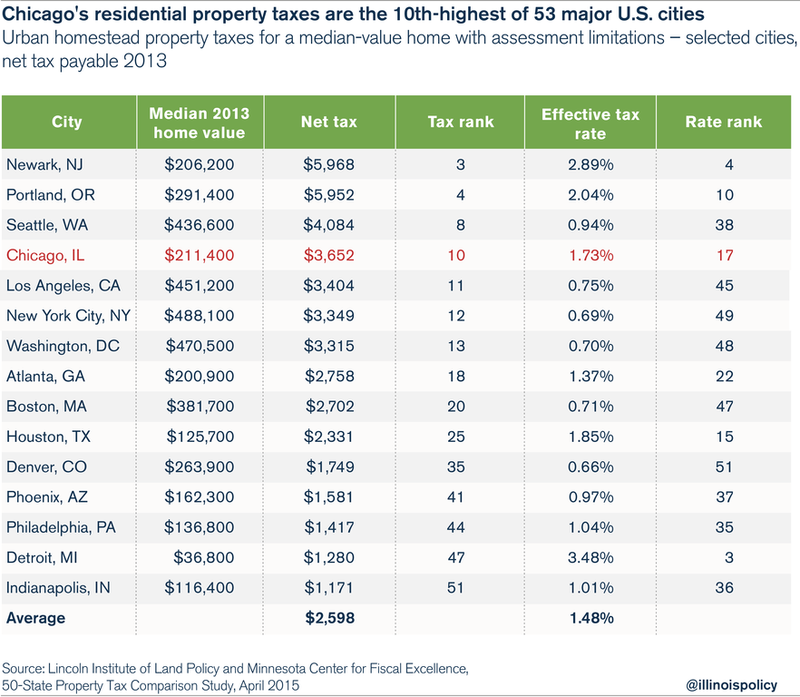 Chicagoans already shoulder the highest tax burden of any residents in Illinois’ major cities. A $543 million property-tax hike and a $180 million increase in other taxes and fees will make that burden even heavier. 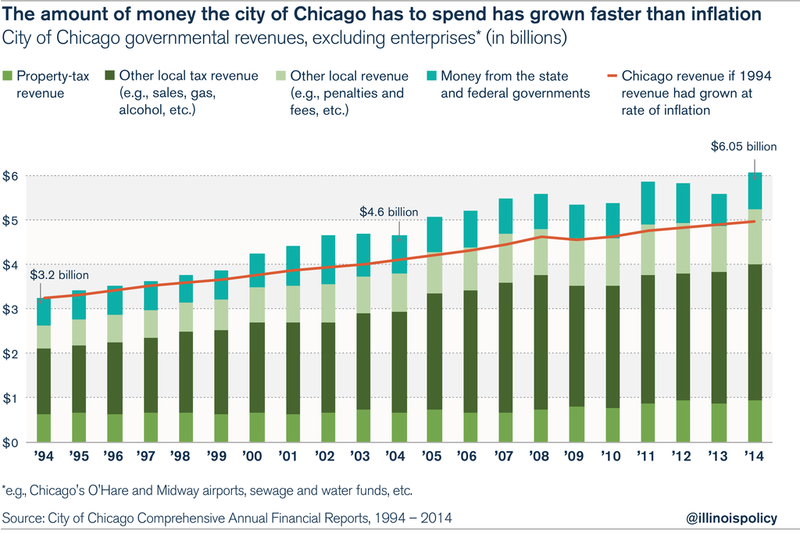 And tax-hike proponents’ other argument, that Chicago’s weak revenues leave the city no other option, doesn’t hold up. Chicago’s revenues have risen faster than inflation over the last 20 years – the city has never had more money to spend. Rather than accept the next tax hike, Chicagoans should send the mayor back to the drawing board and demand he go back to the City Council with real reforms, such as moving new city workers into 401(k)-style retirement plans and examining city contracts to find additional savings. If the mayor refuses, he may find himself with fewer and fewer people to tax.